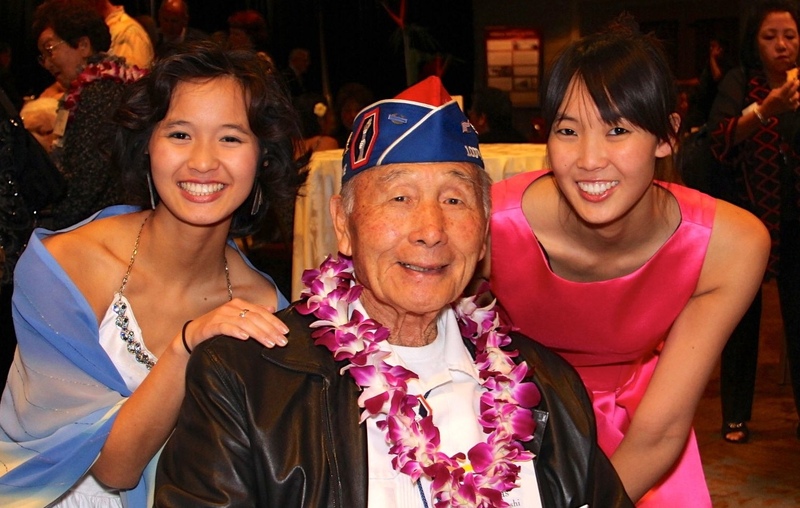 Kelsey Nakaji Kwong (left), Mas Takahashi (center), and Jillian Nakaji Kwong (right) at the 2013 Go For Broke National Education Center Evening of Aloha Gala Dinner. On Saturday, July 25, 2015, Japanese Americans lost more than a WWII hero. We, as a community, lost a true friend and most importantly a wonderful person with the passing of Masao “Mas” Takahashi. While I love to read the great stories about Mas and the work he’s done for the Japanese American community, I can’t help but feel like a major part of the story is missing. This part is so subtle but so fundamental in explaining why Mas had such a significant impact everywhere he went. It sheds light on why everyone whom he crossed paths with remembers him so fondly with heartfelt words of genuine appreciation and admiration. To be honest, I don’t remember Mas because of his military achievements or because he was a war hero. I remember Mas first and foremost because he was a genuinely great person and friend who just happened to be instrumental in saving the world over 70 years ago with thousands of other Nisei veterans just like him. When I think of Mas, I think of him like a grandfather who like many others at Go For Broke National Education Center (GFBNEC) took my little sister and me under their wings and invited us to become part of their family. My fondest memories of Mas involve sitting around a table at the GFBNEC office every Monday chatting and laughing about everything from his life before the war in Modesto, to wrecking havoc in the orphanage, to camp life in Manzanar, falling in love with his wife Elma, following her to Detroit, being drafted, fighting in Europe, life on the front lines, the assault on the Gothic Line in Italy, almost missing his boat back home to the United States, post-war resettlement life, and beyond. I also treasure the less exciting but equally memorable stuff. Mas’ love of games and gadgets, how he lamented the fact his family bought him “a ‘dumb’ phone” instead of a smart-phone with a touch screen, when he learned how to text and was sending messages to all his family and friends until he found out he didn’t have free texting, which Indian casinos had the best buffets (Valley View), the latest happenings in football, basketball, baseball (pretty much any sport), the reason why one team lost and strategies to fix what went wrong (“See, this is how you do it…”), how all his golfing buddies “died on him” so he had to golf alone, fixing cars and everyday things, what he cooked for dinner the night before, pretty much anything and everything. I also remember the funny things that used to drive his family crazy. In summer of 2013 he had so much foot pain he could barely stand but refused to use a walker (he said something along the lines of “I don’t need those, they aren’t cool”). Instead, he had the bright idea of using two of Elma’s canes to slowly but proudly limp around, proving to all the naysayers that he did not in fact need a walker. One of my favorite recollections was when Mas and the family came to my little sister Kelsey’s college hula show last year. Seated in the middle of a row, without thinking I jumped over my seat into the empty row behind us to exit. When I turned around, to my horror I saw 89-year old Mas also attempting to jump over his seat. An understandably exasperated son, Scott, told his dad to stop before he fell and broke his head open. But true to form, Mas just ignored him and continued to high step over that theater seat. It took about three minutes (the aisle had since cleared by then) but a beaming Mas emerged from the empty row behind us with his head held high. The last thing I remember was Mas gloatingly muttering, “Told you I could do it” before he strutted off to the lobby while a defeated Scott followed slowly behind, shaking his head. Just like our grandfather who passed away years ago, you celebrated our successes and cheered us on through whatever challenges we faced. You came from far and wide just to hear us sing or dance and beamed with pride no matter how many mistakes we made. You always made sure to ask how my older sister, Tiffany, was doing and whether my mom was still hula dancing and playing ukulele. You also shared in our trials and tribulations. You empathized with our struggles but also reminded us that some things could not be changed. During these times, we followed your example of magnanimity and reflected on the good things we had going for us rather than what we didn’t. We learned to look at every day as a new day and to make the best out of the hand that was dealt to us. But most of all, we cherish the memories especially seeing your face light up whenever Kelsey performed the “Go For Broke” song. Seeing your normally jovial self overcome with emotion never failed to move us to tears. This song has come to embody our love for you and all the Nisei veterans who fought bravely during the war. To us, it represents not only the love, honor, duty, and sacrifices you made in service to your country but in turn epitomizes the love, respect, and commitment we have to sharing your story and carrying on your legacy and that of all Nisei WWII veterans. You make us proud to be Japanese Americans. Kelsey and I understand the privilege that we have been afforded getting to know you, your family, and your experiences over the years. With this privilege comes great responsibility. This responsibility is shared amongst all whom have had the honor of getting to know you. We promise we will remember, we promise we will share, and we promise to never forget you or the many Nisei who are no longer with us. Knowing how much it meant to you, how could we do anything else? We love you Mas, we always will. Editor’s note: Services for Mas Takahashi will be held on Sunday, Aug. 9, from 1 to 4 p.m. at Gardena Buddhist Church, 1517 W. 166th St. in Gardena. For those who would like to bring a photo or share a memory with the family, there will be a display. That was a very poignant memorial, Jillian. Great work.